You've probably heard the old adage about taking half the clothes and twice the money. While a bit extreme, it is not that far off the mark. U.S. domestic airlines now charge for meals and snacks. For a domestic flight, your checked bag will cost you a baggage fee. A second checked bag will cost even more. Did you check to find out if the cost of your hotel room includes all taxes? If not, you may be in for a big surprise when you check out. Want to connect the Wi-Fi in your laptop? There may be a fee for that. If you are traveling internationally, may hotels and B&B's list room prices PER PERSON, not per night. And then there are ATM fees, tips, local payments (on international travel), car rental fees, hotel service shares and any number of small (and sometimes big) fees. Think your cruise fare pays for your entire trip? Better check again. Most cruise lines now add tips to staff directly to a passengers account. Yes, you can change the amount and even stop it. But you need to know about it to take action. Want a beverage other than water, tea or coffee? There is a charge for that. Want to take a shore excursion? There is a charge for that too. Plan for the unexpected. The unplanned taxi ride or the extra battery for your camera that you lost. Depending on the number of people in your party, plan an extra $25 to $50 per day for unplanned expenses. It will be nice if you come home with the extra money but if you do run into extra costs, at least you will have planned for it and have the money for it. Most of us know that if you cancel your hotel reservation last minute ... which could be up to 48 hours ahead ... you may end up with a cancellation fee. Want to avoid that? Call the hotel and tell them that you don't want to cancel ... just move the reservation to the following week. Then call the hotel back, trying to get a different person on the phone ... such as calling at a different time of the day ... and cancel the reservation. It is true you've got a limited amount of vacation time. And it is understandable you want to get the biggest bang for your buck. So you cram as much as possible into your sightseeing itinerary. But there are some good reasons to leave some time for the unexpected. When we travel to meet up with any cruise or tour, we always fly into the starting city at least one day early. We've experienced too many late flights to add that kind of anxiety at the beginning of our vacation. Yes, it appears to cut the vacation a day short but if it is a new city, it gives us time to explore before starting the next phase. If you are doing an independent itinerary, and your time is your own, leave room for that fantastic deserted beach or locals-only cafe you just discovered. Some of our best experiences have come about by talking with other travelers who advised us to "not miss" a certain museum, park or event. For us, it is very often the unexpected and unplanned that remains the best memory of our trip. Airlines have what they call "legal" connection time between flights at various airports. So when you book a flight with a connection, itinerary options you are given follow those rules, leaving you 20 to 30 minutes for changing planes in airports like Atlanta and Chicago. Sometimes it can work out OK. Flight times are padded to allow airlines some leeway, ensuring that they arrive "on-time," keeping their on-time performance numbers up, so they arrive early. But one way they do that is by shutting the gate early. I've been on several flights that have pushed away from the gate five minutes early. So even if you arrive early, your connecting flight may be departing early. Allow at least an hour between connecting domestic flights and two hours between connecting international flights. Allow even more time if you have to change terminals, such as from one receiving international flights to one handling domestic flights. I've got a pretty long post over at my other travel blog ... If you'll be traveling to Europe and plan on going from country to country by train, you may find the post very helpful. Cyber Monday sale at Luggage Guy. If you need luggage, this is a great opportunity!!! There are a lot of free apps to help you find your way. Germs, Germs and MORE Germs! Third world countries have their own methods of travel, whether it is a taxi or an airline. But not all of them adhere to the same safety standards you will find in the U.S. So be sure to check out a company's safety record before booking your air or train ticket. In a search engine type in "crash" or "safety record" and the name of the company you are considering using. It might make you change your mind about your mode of transportation. Be careful about buying discounted passes or tickets unless you really know you are going to use them. Before we left home, I almost bought a pass to use on public transportation in Venice. Good thing I didn’t. We managed to do what we wanted to do on the waterways with a 36-hour pass bought right at the vaporetto ticket booth – a much less expensive option. Just because something is a great deal – and it may truly be – it isn’t worth buying if you won’t use it or it blows your budget. Maybe staying at the Ritz for $325 per night at Tyson’s Corners, VA is a real deal but is it worth paying that when you can get everything you need at another hotel for $150 per night? Typically the right thing to do when in a car accident is share information with the other driver -- driver's license number and insurance company information. DON'T, however, let the other driver take a picture of your driver's license. It can be used as a way to steal your identity. Also, if the other driver does not have a driver's license, do not give him or her your information. Used to be you could walk into a travel agency, or call your friendly agent on the phone, and book your whole trip and you’re done. Not any more. The Internet provides, literally, hundreds if not thousands of sites that you can use to book air, hotel, resort packages, car rental and more. Each of those sites, of course, will tell you that it offers the absolute best deal. Unless you’ve already done some research, and you know that $400 roundtrip fare from LAX to Madrid, in the middle of the summer, is a once-only-chance fare, keep shopping. Use sites like Kayak.com to do the work of checking fares at multiple airlines. Use sites like Priceline to save on hotels and car rentals. Hotel discounts can be found at sites like Hotels.com. And be sure to check with your hotel directly before booking. If you can provide documentation of a rate being displayed at a discount site, some hotels will match it and let you book directly with them – a great option if you are a member of the hotel’s affinity program. Loss: This just happened to a friend of mine. She had one 8 GB card with her and had to take a taxi back to her hotel because she was ill. Not thinking right, she left her camera in the taxi. No trip photos. To say she was upset was putting it mildly. Planning on Tobogganing in Switzerland? Switzerland's Preda-Bergun toboggan run is the longest in Europe that is illuminated for nighttime use. You can sled on it until 11:30 p.m. The 6-kilometer course (around 3.7 miles) begins in Preda and drops 400 meters (1,300 feet). The average run time is half an hour -- although the record is only five minutes. Visitors take a narrow-guage train from Bergun to reach the head of the run in Preda. A single run ticket costs CHF 13 (around $13) for an adult and CHF6.6 for a child aged 12 to 17. A half day ticket costs CHF26 for an adult with a full day ticket costing CHF36. From Bergun, more daring sledders can take a chairlift to the head of the 4-kilometer Darlux-Bergun run, which drops 576 meters, has many tight turns and is only open during daylight hours. A single run is CHF for an adult and CHF11 for a child. The runs are open mid-December to mid-March and closed December 24 and 31. If you don't have your own sled, you can rent one for CHF8 to CHF30. For more information, contact Bergun Filisur Tourismus. I've traveled all over the world but I have never had such a unique guide as those provided by the children of Salaam Baalak Trust City Walk . Unfortunately, these children know the Paharganj area quite well as they grew up on the city streets. Now, with the aide of the non-profit Salaam Baalak Trust, these children now have food, shelter and future opportunities -- with some of them working as guides. The child guides lead their guides through back streets lined with temples, recycling shops and a pottery market. Personal takes of survival are often part of the tour commentary. The city walk ends near one of the shelters, where visitors can observe the children in their activities and classes. A sure way to maybe end up paying too much for airfare is by setting vacation dates and then refusing to change them. Admittedly, a lot of people don’t have flexibility for their vacation time but if you can leave or come home a few days one way or the other, then check out airfare options. Typically, you’ll find the lowest airfare for flying on Tuesdays and Wednesdays. Friday and Sunday will cost the most, but this can vary depending upon your route. When using the Internet to search for airfare, be sure and use the Flexible Date option – this will give you an idea of the airfares around your initial dates. Flexibility in dates also can pay off on your hotel bill. When visiting our grandchildren, my husband and I stay at a Homewood Suites in a business area. During the week, the rates are over $160 per night. When we stay on the weekends, with our AAA discount, the rate drops to $90 per night. Chip and pin credit cards have a microprocessor ship embedded in the card and when it is read at the point of sale, the customer inputs a PIN. This technology has been used for years in Europe. The idea is to provide better security and reduce the cost, to the banks, of losses due to credit card theft. Banks in the U.S. didn't follow this trend. From what I understand, the cost of implementing this new technology is more than the cost of losses. However, finally, some U.S. banks are issuing credit cards that have, in addition to the usual magnetic strip, the chip and pin technology. Bank of America is leading the way. All of its new Travel Rewards, Privileges, Virgin Atlantic and Merrill Lynch credit cards will have the chip and pin. Upon request, B and A will replace several other cards with the technology including affinity cards from Royal Caribbean and Norwegian Cruise Lines. Turning Left. Watch Those Front Wheels. I know I'm sometimes guilty of this ... I want to make a left turn and I am waiting for the traffic to clear. As I pull into the intersection, I'll turn my front wheels like this \\ getting prepared to make that left turn. WRONG! Keep your front wheels straight on like this ||. Why? If someone hits you from behind, with wheels turned you'll be pushed into the on-coming traffic. Recently, a driver in a nearby town was killed when this exact thing happened ... the driver was waiting for traffic to clear, the driver behind him hit his car and he was pushed in front of an on-coming truck. Luggage Guy is having a sale on everything. You start by saving 65 to 75 percent off designer luggage and then another 30 percent on top of that!!! Driving? Forget 2 and 10. W...a...y back when, when I first learned to drive, I was taught to hold my hands at the 2:00 and 10:00 positions on the steering wheel. I also learned how to make turns by going hand over hand. Current conventional wisdom is to forget all that. Rather that 2 and 10, 3:00 and 9:00 is now recommended. And no more hand over hand. If your airbag goes off and you have your hands in the 2 and 10 position, you could end up, literally, hitting yourself in the face with your hand or arm and getting injured. Ditto with the hand over hand. The new idea is to keep your arms and hands away from the middle of your steering wheel ... and your airbag. If you will be visiting Central or South America, you will find that US dollars are accepted almost everywhere. Change may be in local currency so be prepared with small bills: $1s, $5s and $10s. The bills need to be in excellent condition. That means no writing on them, no tears and no signs of wear. If youare in doubt about the bills you are taking, make arrangements with your bank to get new currency. Whatever you do, don't take $100 bills to use anywhere other than your hotel ... and maybe not even there. We travel with only $1s, $5s, $10s and $20s in cash and get local currency from an ATM machine. Be a good visitor to the local people. Don't be like some of the travelers on a recent trip we took ... the day after tips were given to the staff, two (that we know of) approached travelers, including us, asking if we had crisp bills to trade with tip bills they had been given. One crew member had a $100 bill! It was in excellent condition but it would be very difficult for him to change. We also traded some smaller bills with him ... no writing or tears on any of the bills but we could see where some of the bills he had been given were worn around the crease. The airline Iberia and the bus line ALSA, in Spain, have announced a partnership in which passengers on Iberia can book connections by bus from Mardrid Barajas International Airport to the cities of Albacete, Burgos, Lorca, Soria and Valldolid directly through the airline's ticketing system. Not only is it cheaper than booking the tickets separately, but if the plan is delayed, the airline and bus line are responsible for getting passengers to their destinations -- the bus connections are guaranteed. Passengers should pick up their luggage in Madrid at Iberia's Terminal 3 and can find the buses departing (and arriving) at the terminal's ground level. Save on Hotels - 40% Off! Hotels.com is having its big Fall savings. Saving 40% if you book by October 1. Some people do not like to use the airline affinity credit cards because they have a fee of about $100 per year. But if you travel a lot, the new benefits available by using these cards may more than outweigh the fee. If you pay for your ticket (or the taxes and fees on a frequent flyer ticket) with the matching credit card, you may now be able to enjoy perks such as priority boarding and one piece of checked luggage for no fee. We recently fly to and from Lima on frequent flyer tickets with taxes paid on an AA affinity card and had priority boarding. Very nice, getting on board early -- no fighting for overhead bin space and not worrying about holding up the line. We live in Western NY and have driven to Toronto many times. We always have used the Lewiston-Queenston bridge because, in the past, that has been the fastest way to get across. It took us over an hour go get across and the traffic was just as bad in the other direction. Afterwards we learned there is a new outlet mall right over the bridge on the U.S. side and Canadians are coming over, in droves, to shop. We returned using the Rainbow Bridge at Niagara Falls and it was much faster and much easier. If you'll be traveling to Singapore and want an easy to carry travel guide, there is an app for that. Called "Singapore: The Savvy Guide," it offers recommendations on Singapore sights, dining and off-the-beaten-path experiences. It is available for $3.99 from the iTunes app store and works with the iPhone, iPad and iPod Touch. Do a Google search on "hotel Window fall" and you will find enough results to demonstrate that you should never lean against a hotel window. There are stories of windows simply falling off of a hotel building. And other stories of guests who leaned against a window which then dislodged. Whatever the reason or the cause, never lean against a hotel window. Actually, never lean against a window in an high-rise building. There is now a free information service called the Cayman Concierge that is staffed by personnel who are experts on the Cayman Islands. Some of the staff members have worked in the Cayman Department of Tourism for over 20 years. The team can help visitors with many of the experiences available on the islands, including bioluminescence kayaking, blue iquana tours and helicopter flights to looks for turtles and eagle rays. The service can be reached by email at concierge@caymanislands.co.uk. Berlitz offers a full cruising guide which has route maps and details on 285 cruise ships. It also has information on specialized cruises and how to go about getting the best cruise bargains. Before you buy your travel insurance, ask the company what happens if you simply decide to cancel the trip. Some companies, like Access America, will allow you to transfer the coverage to another trip. With Travelguard you'll lose the premium. Best to know the answer to this question before you buy. All else being equal, it might make your decision about which travel insurance company to use. An exhibition on the Antikythera shipwreck is being held in Athens at the National Archaeological Museum until April 28, 2013. The ship, which had been full of valuables and art headed for Italy, sank south of the Pelopannese peninsula some time between 60 and 50 BC. Excavations were done in 1900-01 and again in 1976 and all of the antiquities are on display. A highlight is the "Antikyther mechanisam" which calculated astronomical positions. You can now scoot around the rainforest in Queensland's Lamington National Park on an all-terrain Segway. The tours are open both the guests and day visitors at O'Reilly's Rainforest Retreat. To ride the Segway you must weight between 100 and 265 lbs, have closed toed shoes and have no heart or balance problems. Be sure to reserve ahead. Two tours are offered each day, the first is simply a training session and lasts around 30 minutes. The second begins with training and then heads off on a 90 minute tour, exploring a eucalyptus forest, Moran's Falls and going through creeks, with views of the Great Dividing Range. If you will be shopping at a duty free shop on your return to the U.S., don't forget you will have to deal with the TSA liquids and gels 3-1-1 rule. Purchases from the duty free shop are delivered to the traveler directly on the airplane. However, after you go through customs in the U.S., if you have a connecting flight, you will have to pack any bottles over 3 oz. in your checked suitcase. So if you travel with only carry-ons, it means putting the liquid into your carry on and checking it -- no choice if you want to get that bottle home. If you normally check a bag or two, it's not an issue unless your suitcase is already stuffed to the gills. So if you plan on buying liquids at the duty free shop, be sure to leave room in your checked luggage so you can easily transfer the bottles into your luggage after clearing customs. If you are into art and will be heading to the southeastern Brazilian state of Minas Gerais, be sure to check out visiting the botanic garden and art gallery Centro de Arte Contemporanea Inhotim. There you will find 5,000 acres with two dozen art pavilions housing contemporary art by Brazilian and international artists. Admission is free on Tuesday. Wednesday and Thursday admission is BRL20 and Friday through Sunday it is BRL28. For an additional BRL10, you can purchase a pass to ride the hop on/hop off electric cars that are driven between the three main stops within the park. If you will be staying in Belo Horizone, there is a direct buss (BRL25) leaving town at 9:15 for the one hour trip, returning at 4:30 p.m. when the park closes. 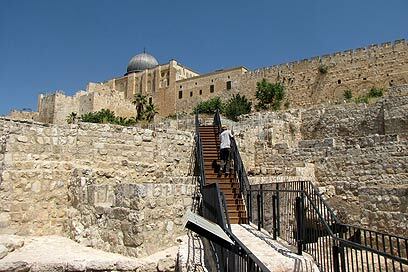 The Walls Around Jerusalem National Park is now open to the public, a complex of buildings from the tenth to the sixth century BC. The remains were exposed during a multiyear dig and have been named the Ophel City Wall (see Nehemiah 3:26). Passageways have been built around various buildings which include a gatehouse, royal edifice and a fifth century AD wall. Also on display is a clay tablet thought to be the earliest written document to be discovered in Jerusalem. Hours are 8 a.m. to 7 p.m. (3 p.m. on Fridays) from April to September and 8 a.m. to 5 p.m. (1 p.m. on Fridays) the rest of the year. Traveling with a pet? DogFriendly.com and BringFido.com are two websites that provide free listings of dog friendly places worldwide -- hotels, restaurants, resorts, attractions and even airlines. PetsWelcome.com also includes information for cats and other animals. All of the sites have forums where other pet owners share information about their travel experience. Marking the 100th anniversary of the discovery of the Nefertiti bust at Akhetaton, an exhibit titled "Amarna 2012 - 100 Years of Nefertiti" will be held in Berlin's Neues Museum from December 7, 2012 until April 13, 2013. On display will be approximately 400 object from the Akhetaton dig, presenting a picture of life in Egypt during the Amarna period (1343 to 1334 BC). The artifacts include ceramics, jewelry, sculpture, pigments and tools. This will be the first time on exhibit for most of the items. "Star Wars Identities: The Exhibition" is currently being hosted at the Montreal Science Center until September 16 and then will move to Telus World of Science in Edmonton, Canada where it will remain until at least April 1, 2013. On exhibit are props, costumes, model and artwork, including C-3PO, a full sized Podracer and Darth Vader's costume. There are also sections that focus on the creation of the characters and the making of the movie. If you need a rental car between now and July 1, you can save by using this promo code at Payless. Starting November 1, 2012, a new law will be enforced in France that requires all cars, including rentals, to carry a breath-alcohol-testing instrument. If the driver does not have one, he will be fined 17 Euros (about $22). Single use devices cost about $2.50 each and Hertz says it will provide them for free. No word yet on what Avis and Budget will be doing. Alcohol limits are tighter in France where 50 mg per 100 ml of blood will put you over the mark. In the U.S., depending upon the state, the range is 80 mg to 100 mg per 100 ml of blood. The minimum penalty in France for driving over the legal limit is 135 Euros (about $180). If the blood alcohol level is over 80 mg, the penalties go through the roof. Allianz Classic plan is their most popular plan. It is perfect for families since it covers children under 18 FREE of charge -- a very rare travel insurance benefit. Check out promotional deals. If 62 or older, you’ll get a 15% discount on Amtrak and for passengers 60 or older get a 10% discount on Canada’s VIA. Be sure to click on links for Deals or Specials. Check out last minute offers. Amtrak offers Smartfares under its Deals tab. Most are short term and last minute types of deals but it could work for you. They change every week on Tuesday. For Canada’s VIA rail, take a look at its Express Deals. Look at an Amtrak vacation package. These are available all year around and include more than just your train fair. And you might be able to snag an early booking discount. Joint Amtrak’s Guest Rewards Program to earn points and save on future travel. Check into Amtrak’s multi-ride discounts and monthly passes if you ride the same route regularly or simply take the train often. On the Caribbean islands of Grand Cayman, Little Cayman and Cayman Brac, 25 hotels, condos and house rentals, in addition to seven activity companies such as Luxury Charters and Indigo Divers, are offering a "Worry Free Hurricane Guarantee" for the hurricane season, June 1 to November 30. Guests may cancel reservations with as little as 48 hours' notice with no penalty or, at most, one night's cost, as opposed to the 100% penalty for late cancellation that is charged the rest of the year. In addition, guests are compensated if they have to leave early because of storm by being able to rebook at no additional cost. Just a few short days remaining. Save on G Adventures safari to Kenya and Tanzania. Beginning in Nairobi, with its convenient international airport, this 10-day adventure offers up the best of wild Africa on a budget. Track the ‘Big 5’ across the acacia-spotted savannah of the Serengeti and the legendary plains of Masai Mara. Our unique overland truck and smaller 4x4 safari vehicles in Kenya and Tanzania will carry you through the incredible scenery safely and in good spirits—and camping will keep you at the heart of the action. This trip is a once-in-a-lifetime experience like no other. With this much stunning African wilderness, make sure your camera’s charged because you're going to need it. Now that Thalys runs a direct high-speed train on a daily basis between Brussels International Airport and Paris Gare du Nord, travelers flying into Brussels using Jet Airways can transfer to Paris at no extra charge -- or land in Paris and take the train to Brussels. When a traveler books her flight, a code-share number is automatically included for the Thalys. Normally the 1 hr 45 min trip would cost about $100 in first class. For more information, contact Jet Airways at 877-835-9538 or www.jetairways.com. Whether it’s for a vacation home or a permanent relocation, many people look abroad. Known for its famous casino, Formula 1 racing and being tax-free, the Principality of Monaco – the second smallest country in the world – also has some of the world’s most fabulous beaches. If you are looking to buy property near a world-class beach, then Monaco should definitely be on your list of countries to check out. Along the coastline you’ll find fantastic beaches of all sizes and shapes. If you are looking for Monaco properties and easy beach access is important to you, this information on two of the great Monaco beaches may be helpful to you. Want to be on the most famous stretch of beach in Monaco? Then you want to be near Lavortto Beach, located between the Monte Carlo Beach Hotel and Grimaldi Forum. True, some of the beach has tiny pebbles instead of stand, and a good portion of it is private, there is still tons of it left over for the public. This beach is cleaned every day and you’ll find some excellent restaurants and bars there. Next door is the Monte Carlo Beach, which is private. Not only does it have a great beach but it also has a salt-water pool. If you know someone who is staying there, you might be able to get a peek at the private beach. Whether you are looking generally for apartments in Monaco or, specifically properties for sale Monte Carlo remember that one important feature will be location, location, location. Summer is here and so is your Summer Blowout Sale - for 2 weeks, Save an EXTRA 30% off using coupon code - SUMMER Summer Blowout Sale - Save an EXTRA 30% off "SUMMER"
Summer Blowout Sale - Save an EXTRA 30% off "SUMMER"
CJ Exclusive - Pierre Cardin Signature 4 Piece Luggage Set - $189 after $100 off coupon - "PCSLG" LIMITED TIME ONLY!!! CJ Exclusive - Pierre Cardin Belmont 4 Piece Luggage Set - $99 after $100 off coupon - "BELPC" LIMITED TIME ONLY!!! Visitors to the Palace of Holyroodhouse in Edinburgh, Scotland can combine the tour of the residence with a half-hour "Garden History Tour". Located at the east end of the Royal Mile, the garden tour includes the ruins of a 12th century abbey and the site where the Queen's Garden party is held. The guided walk is available hourly, with the last tour starting at 5 pm. Combined garden/residence tours cost £12.80 for an adult, £11.65 for a senior, £7.85 for a child 6 to 16 and children under 5 are free. The city of York celebrates its 800th birthday on July 9, the year when the royal charter was granted. On that day this year, musicians and choirs will perform a specially commissioned musical piece at the Eye of York, a lawn by the city's 18th-century administration buildings. In addition to exhibitions, festivals, music and tours, other events include the York Cycle of Mystery Plays, Aug 2 - 27, the Traditional Dance Festival on September 8, and Illuminating York October 24 - 27. Further details are available at York City of Festivals, 18 Back Swingate, York England Y018ZD and www.yorkfestivals.com. Save on flights to Mexico with AeroMexico at Vayama.com! The French Riviera has long been a very popular destination. Travel to the area started around the late nineteenth century and it still continues to attract visitors of all ages, all the way from the very wealthy who take advantage of French Riviera villa rental to students who are backpacking across Europe. Many of the names of the towns and villages along the French Riviera are familiar to most people. Cannes is where the International Film Festival is held every spring. The small old port is the heart of the city where you will see some yachts that appear as big as some cruise ships. Monte Carlo is a small picturesque town with beautiful gardens. It is popular with racing fans as the Formula One motor race runs right through the city streets. And Monte Carlo is the place for gambling that is very different from what you’ll find in Las Vegas—it is quiet and subdued. Nice is known for the beautiful water, shopping, great restaurants and architecture including ancient Roman ruins and the Russian Cathedral. There are many additional attractions along the coastline. Of course there are the beaches, boardwalks and waterfronts. There are also excellent museums, world famous festivals, fishing, diving, golf courses and wineries. The French Riviera is a great destination for an extended visit, looking into villa rentals South of France, and using that as a base for day car trips. A wide selection of luxury villas in South of France can be rented, whether you want to stay in a waterfront proper, a country manor or an authentic stone farmhouse. Malaysia Air has banned infants from flying in first class on its 747s. Additionally, starting July 12, it is going to become the first airline with a kid free zone in one of its sections of economy class. For flights on its Airbus A380, children under 12 who are flying economy will be restricted to the lower deck. The online res system will not even display upper deck seats to passengers who are buying tickets for young children. To counter the bad feelings this might incur, the airlines does offer some perks to families with children including early boarding, special meats, on board entertainment, and, in some areas, play areas. The Reichstag dome, in Berlin, was closed to visitors in 2010 because of bomb threats. The dome was reopened in April 2011 but if you wanted to visit, you needed to preregister at least a few days ahead. Now, as of March 2012, the registration an no longer be done by phone and must be done in person or on the Internet. Travel to India just got cheaper. As of May 31, the exchange rate for the rupee hit an all time low with 56 rupees to the dollar. This is the lowest rate in over 60 years. If you are looking for a good resource for worldwide airport information, check out I Hate Taxis. At the site you'll find information on alternative transportation methods from the airport into town. There is info on taxis (in spite of the site's name), public transportation, shuttles and more. Additionally there are destination tools, travel and money advice and medical suggestions (like a first aid kit). And this is just a sample of what the site has to offer. Honduras now has the highest murder rate per capita in the entire world. There has been an increase in gang and drug violence. During the chaos around the government crisis in 2010-11, organized crime expanded its reach, bribing judges and police. The police are not able to handle the current crime spree and the president is proposing asking for military assistance. Over 75 Years of Age? Spending some time in a new city? Sport’s fan? How about taking in a local ball game? Through Ticketamerica you can get minnesota twins tickets, los angeles dodgers tickets and milwaukee brewers tickets. Some people never buy travel insurance. My husband and I, on the other hand, always buy travel insurance. In the past it was because we had elderly parents and need to be prepared in case something happened to one of them. Now it is because of our own health status that we buy insurance. If you decide to buy trip insurance, here are some tips that might help you out. If you have a chronic health condition, be sure to buy insurance that covers pre-existing conditions. Typically, this means you have to buy your insurance within a set period -- for instance within two weeks -- of depositing your trip. Confirm that the insurance company will pay medical expenses directly. This will save you from the hassle of paying the expenses yourself and then waiting for reimbursement. If you will be traveling independently and have minimal prepaid expenses to worry about, you can buy a freestanding emergency medical evacuation policy from a company like Divers Alert Network. And you don't need to be a diver to take advantage of their coverage. Two excellent sources for comparing travel insurance coverage and cost are SquareMouth and Insure My Trip. While many large hotels have a fitness center for use by their guests, not every traveler likes to stay in a large hotel. So what do you do when traveling and want to maintain your fitness routine? You check out the website Tour de Fit. The sit helps travelers find gyms, wellness centers and spas worldwide. Additionally, it provides information on other fitness activities such as pilates, rock climbing and bikram yoga. The concept of West Africa cruising is very new to the word of travel. These cruises will enable you to discover this under-explored area of the continent with ease, while uncovering West Africa's unique and varied historical, cultural and natural landscapes in comfort and in style. There are three itineraries available in April 2013 that will allow you to visit 10 African nations. Itineraries combine activity and leisure including, bird watching with naturalists, local market visits, UNESCO World Heritage Sites and visiting the birthplace of voodoo. Due to the shutdown of its nuclear reactors, which provided nearly 30% of the nation's power, Japan will be experiencing power shortages again during the summer months. It is possible conservation methods will be put in place and there may be rolling blackouts in times of peak summer demand such as evenings in Tokyo. If you'll be traveling to Japan, prepare yourself for the possibilities of subway delays, reduced lighting and reduced air-conditioning. Carnival Cruise Lines suspended a popular guided hiking excursion to the jungle near El Nogalito Mexico after 22 guests on a bus were robbed, on February 23, while returning to the ship. Fortunately no one was injured when hooded gunmen boarded the bus around 5 p.m. and took watches, money, cameras, etc. The tour operator was criticized by local authorities for failing to follow security procedures and for running the tour late in the day instead of in the morning. While Carnival has cancelled this tour, it is unknown at this time if other lines have cancelled similar tours. Also, it is certainly possible for cruise passengers, without realizing the problem, to plan on booking private tours to the area. It appears to be a good idea to avoid this area, whether booking with a cruise line or privately. Bored at listening to the preflight cabin safety instructions? Me too. So major kudos for Thomson airways coming up with this unique approach. If you'll be visiting the island of Dominica, be sure to add Papillote Tropical Gardens to your to-do list. It is located on the southwestern side of Dominica, about 40 miles inland from the capital. Papillote is a true tropical garden, with a trail system, two waterfalls, hot springs and bathing pool. You can do a day visit, using a tour company such as Nature Isle Explorers, or stay right next to the gardens at Papillote Wilderness Retreat where you'll find comfortable rooms, simply furnished and built in the West Indian style with tile floors and wood-shuttered windows. Ever end up with a seat in the row in front of the emergency exit row -- and then find out the seat doesn't recline? Ditto with the seats in the last row in an economy cabin. Do you have an overnight flight and don't want to be near the galley or the bathrooms? Several websites can come to your rescue and help you pick the best seats or simply avoid the worst ones. The sites are Seat Guru, Seat Expert and Airline Quality. Seat Guru has really improved since I first started using it. Previously, a bit of research had to be done, finding the equipment that was going to be used on my flight. Now Seat Guru, like Seat Expert, asks for your flight information and finds the equipment for you. Airline Quality goes even further by providing airline and airport reviews. All of these sites are a wealth of information. For instance, on Seat Guru, when you click your airline, a page comes up with detailed airline information including equipment, contact information, and in-flight amenity information. Tabs along the top provide additional information about baggage and check-in requirements. Ever wonder if you should spring for the extra bucks to get an upgraded economy class seat? United calls them "Long-haul Premium Economy Class." The chart on the Seat Guru site shows that generally, the premium seat provides 3 to 4 inches of additional leg room. If you have a long haul flight, the cost of that premium seat might just be worth every penny. Looking for a quick getaway? Check out Groupon. Visiting a city in the U.S. or Canada and want to save on restaurants? Yup ..... check out Groupon. Groupon can not only provide you with discounted getaways and restaurants but also sporting events, shows, amusement parks and much more. If you are not already a member, you can sign up at this Groupon link. Well, not exactly laundering money. Ironing, maybe. There are many countries, particularly in Latin America, that will accept U.S. currency in addition to their own. However, the bills must be clean, unmarked and in very good to excellent condition. So if I was heading to Latin America, I would start putting aside $1s, $5s, $10s and $20s that meet these standards so I have what I need when I'm ready to take off. Sometimes, though, I'll end up with a bill that looks good but is a bit on the crushed/wrinkly side. And those I iron. I set my iron on med-high and give the bill a quick once over. Hipmunk is a new tool for finding flights and hotels. I played around with it for a while. For flights it is really easy to use and I really like the way the flight prices and times are displayed in a grid. Makes it easy to see what is available by several criteria including price and departing time. I tried the hotel search tool also. That worked fine until I tried to use the Heatmap tool. There is a little introductory video that I watched but I still don't understand how to "read" the Heatmap. Might have to play around with it a bit more. When I look for airfare I typically start with Kayak but Hipmunk might be worth checking out. Where in the world is Ibiza? Ever hear of the island of Ibiza? Me neither until I was surfing around the Internet. That’s where I learned that it is an island off the coast of Spain, in the Mediterranean Sea. Then I had to take it step further because I love islands and the beaches and the warm blue waters. I discovered that it is an island known for summer club parties. It attracts a large number of tourists because of the parties but I also learned that the Spanish Tourist Office is working on making tourism on the island more family-oriented. I started to take a peak at the kind of accommodations available on the island and came across villas in Ibiza to rent. Luxury villas to rent on Ibiza are specifically picked for their unique charm, character and location. There is a wide range luxury villas Ibiza, from rustic to contemporary and a whole selection in between. While it is possible to rent a country estate, I know for a fact that if I were to do this, I would rent a beachfront villa. What a wonderful way to spend a holiday, relaxing in a luxury villa on an island in the Mediterranean. Anyone with me? My camera takes 8 megapixel images. My husband's camera takes 18 megapixel images. If I used the images straight from our cameras, the loading of this blog would slow to a crawl. While we want that high resolution for any pictures we print, such high res images are not necessary for my online display. So how do I reduce the size? I use Photobucket. The size of the images uploaded to Photobucket are reduced to about 115 kb, a significant reduction. I then upload the pictures back to my computer. Copy the images in the Zip folder back to your computer - Be careful not to overwrite your original pictures - I use a sub-Folder for resized images. You arrive in a new city and plan on taking a taxi cab from the airport or from your hotel. And you plan on paying by credit card. While most taxis in major cities can accept credit cards, a lot of the drivers don't like taking them and will tell you, at your destination, that you have to pay cash. So, if you really want to use that credit card tell the driver how you'll be paying BEFORE you get into the cab. If the driver tells you that you'll need to pay in cash, grab another cab. A wonderful holiday can happen without spending a fortune. Even though the cost of living is higher today, an individual can still get away and enjoy a break from their daily routine. With a few tips, a holiday will not be too expensive. The economy has people searching for new and cheaper ways to travel to take a holiday. Cheap flights can help a penny-pincher find an economical flight to travel to almost any destination, or someone can choose to holiday closer to home making travel expenses cost even less. Day trips to nearby attractions can save on lodging and fuel. The trip will still give someone a chance to get away from daily life for a short time. However, if someone decides to make it a longer holiday, he or she can seek inexpensive lodging to stay on a budget. Food is one of the most expensive items on a holiday, but there are ways to save and still enjoy the food. If the lodging offers a way to prepare meals, then buy some food and cook it there. Eat out for some of the meals and cook the rest. Some lodgings will have refrigerators to store the food. Sandwiches are great picnic food items to take to a beach or hike instead of dining out. Another expense is the entertainment or activities. Find deals for the attractions or choose places to visit that are free such as some museums or parks. Taking hikes, going fishing, swimming at a beach or a pool are all activities that can be done for very little cost. Entertainment does not have to be expensive to be fun. Holidays can be cheaper at certain times of the year. Save by going during the slow season to get discounts on flights, lodging and entertainment. If you are traveling along the eastern U.S. interstate system, such as I95, I77 or I64, be sure to stop at a welcome center or rest area and pick up the brochures of motel coupons. These coupons can really save you some big dollars. For instance, a stay at a Hampton Inn outside of Richmond, VA would have been $98 if I had just walked in and used my AAA or AARP card. With a coupon from one of the brochures, we paid $69.00. Even better was a Fairfield Inn outside of Savannah, GA. We paid $49.00 for our night there. And that includes their breakfast and free copy of USAToday. Our car trip last spring took us through Nashville. Spur of the moment decision to go to the Grand Ole Opry and we had a wonderful time. And easy way to check what is playing in cities you will be visiting is to visit Ticketamerica.com. Ticketamerica.com has comedy tour tickets for george lopez comedy tickets as well as ventriloquist jeff dunham show tickets and the legend of comedy jerry seinfield theatre tickets. Friend of mine was in Australia and went to get onto her gmail account. Gmail asked for the answers to her security questions because she was signing on from a different country. She appreciated the added security and had no problem accessing her account. But how many of us remember the answers to our security questions. I was born in New York City. I never remember if I answer the question Where Were You Born as New York, New York City or NYC. So I ran into problems a few times until I was casually speaking with a representative of my credit union. She said (duh!) it doesn't matter what I give as the answers to my three security questions. The only point is that if I am asked for the answers, I enter the same text as I entered when first setting it up. In fact, the answers to all three questions could be the same word(s). I have now chosen one easy-to-remember word. It is the answer to all of my security questions. Not very secure? I guess. But at least this way I know I can get into an account if/when I have to. Whenever we travel internationally we call the banks of any credit cards we will be taking with us. We inform them of our travel dates and the countries we will be visiting. We do not do this when we travel domestically and with all of our travels throughout the United States we have never had a problem. Then we were talking with friends who visited Florida and needed to buy a laptop. While at Best Buy, their credit card was denied. It immediately hit me that the problem arose because they were buying an expensive piece of technology. They tried another card and that was also denied. A friend with them tried his card and that too was denied. Apparently, once a purchase gets flagged, any credit card used to try and make the purchase will be denied. All three banks had to be called to free up the cards. If a credit card is denied on a purchase, call the card bank immediately. Do not try other cards and put those out-of-order also. We are definitely a family that likes to spend. We love good food, which means we eat out a lot, and we really like to try new places. One of our other big expenses is travel. Whenever we have spare time we try to get away for an adventure at least for a few days. It gives us something to look forward to and is also a great stress reliever. They way we look at it is that we might as well enjoy ourselves while we still can. We won’t be able to take our money with us when we die, so we might as well spend it on things we enjoy. The only problem is that in order to afford all of this fun stuff we love, we’ve had to cut our budget in other areas. I heard from a friend that we could save on our energy bills here in Amarillo so I searched Amarillo Texas Energy Deals to see what I could come up with. We found a great deal and have been able to take the savings and put it towards another trip we want to take. There is nothing more satisfying than saving and putting it towards another adventure! At the airport lot, back your car into its spot. If you return home to a dead battery or any other problem, this will make easier access to the battery or to a tow truck. Many airports now offer less expensive parking lots but it takes time to get from them to the airport. Leave yourself enough time for that shuttle bus. Pack anything that will be hard to replace in your carry-on, like those special running shoes. Of course your medications and important papers go into your carry-on. Put your quart-sized plastic bag with your liquids in an outside pocket or other easily accessible place. Have complete information for your hotel in case of a delay, including phone number, fax number and email address. Have a printout of the hotel's location, for your own use or to show a cab driver. If you are a frequent flyer member, save your boarding pass. If the airline goofs you don't get credit for your flight miles, your boarding pass is the proof you can provide that you took the flight. Make your checked suitcase stand out from the rest. We use neon green luggage straps and can spot them as they come down the luggage belt and even have seen them being loaded onto the plane. No one is going to walk away with out bags by mistake.